Title: Dogged at Heaton St. Description: Second in a trio of GEs. Z-PTLCHI, 04/11/04. Description: Southern Railway's first GP50 leads a BNSF B40-8W and two ex-Conrail SD50's as P61 works at Barber. 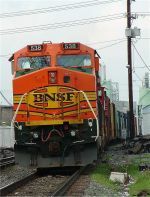 Title: BNSF 538 takes a string of Manufacturers Railway cars west. Description: Two BNSF units lead a long string of roadrailers west. Seen here just west of Penn on the Lafayette District. Description: A BNSF transfer run prepares to cross 16th Street crossing while entering at the east end of BNSF's East Thomas yard after returing from Norfolk Southern's Norris Yard. Description: A BNSF transfer run prepares to cross the 16th Street crossing while entering BNSF's East Thomas Yard after returning from Norfolk Southern's Norris Yard. Description: Not Again! This was the same set from last week. They shouldve put some geeps on instead.